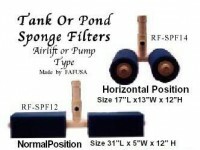 These are all course reticulated sponge filters designed for use in ornamental ponds or larger tanks. Unique design can be used as a airlift tube filter or with a submersible or external pump. All come with three threaded tube adapters for normal aquarium tubing (3/16″), 3/8″ tubing, or 1/2″ tubing. To use as an airlift type filter simply remove cap on top of airlift tube, attach an airline to the side tubing adapter and pull the water through the sponge filters by air lift. Airlift shaft can be extended by placing a longer piece of PVC pipe. For use with a pump leave the cap on and just attach intake line on the tubing adapter. Sponges screw off for cleaning or the entire filter can be removed and hosed with sponges attached. Several models RF-SP14 and RF-SP16 and RF-SP18 can be used in a horizontal or vertical position. Tube attachment fitting is not glued and can be rotated into desired position. Made of high quality PVC and large pore reticulated poly foam. Full length manifold intake screens have been installed inside the sponges. Tank size is indicated but is more dependent on bioload. Most Koi ponds are basically considered low bioload situations since you are not actually trying to grow fish but maintain them.